A well designed small garden shed with large hinged access door for easy access. 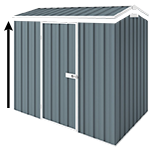 The YardSaver F52 is a well designed small garden shed with large hinged access door for easy access. This zinc Yardsaver F52 measures 2.105m x 0.72m and 1.8m wall height. With some neat organisation this shed can provide perfect storage without taking up more space than required.